There are always going to be situations where dogs and children find themselves in close proximity – local parks and playgrounds in particular. The noise of children playing and running around can be a huge attraction for many dogs but others will find it frightening. Even the friendliest of dogs can become startled and bite if they feel threatened or scared. Remember a dog will always give visual and audible cues before a bite but these are subtle and can easily be missed, especially by young children or to the untrained eye. These are situations where knowledge and education is a key factor for your child to remain safe. 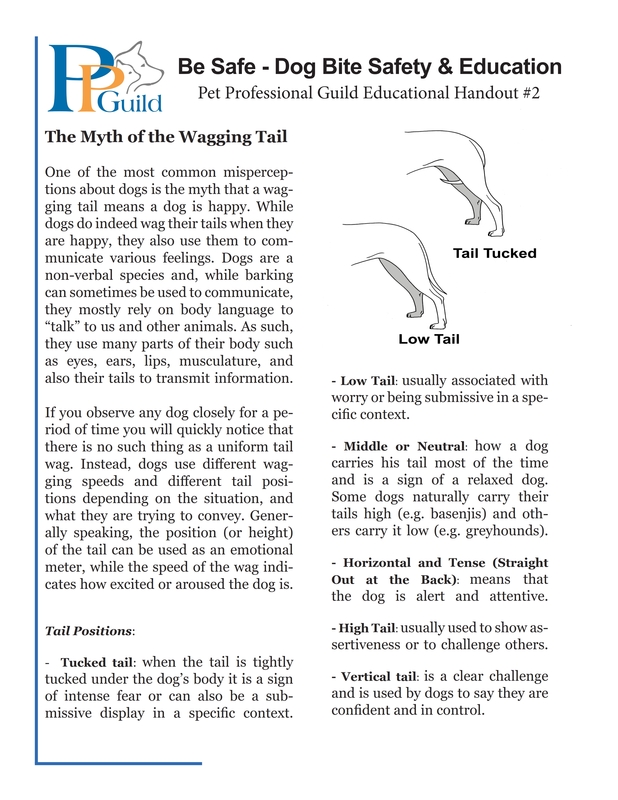 One of the most common misperceptions about dogs is the myth that a wagging tail means a dog is happy. While dogs do indeed wag their tails when they are happy, they also use them to communicate various feelings. Dogs are a non-verbal species and while barking can sometimes be used to communicate, they mostly rely on body language to "talk" to us and other animals. As such, they use many parts of their body such as eyes, ears, lips, musculature, and also their tails to transmit information. 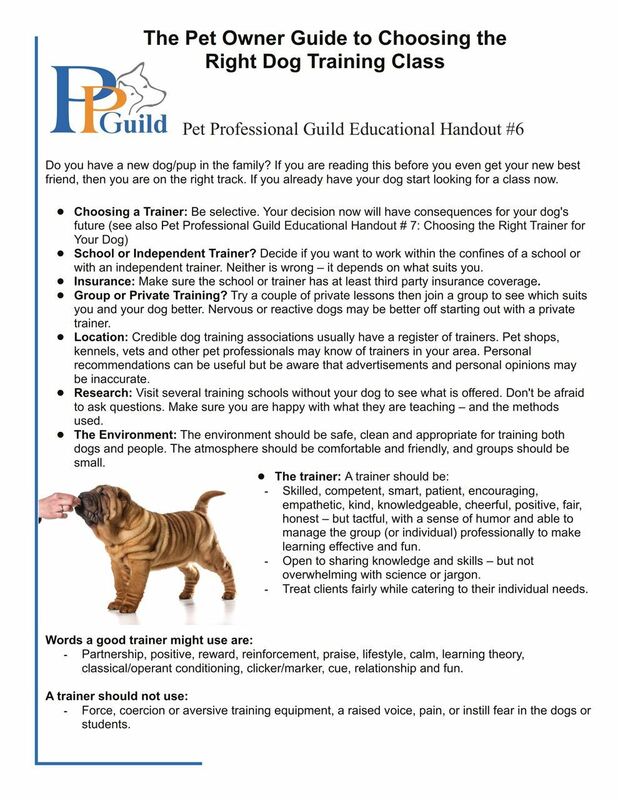 Pet Professional Guild Educational Handout #3: What Are the Rules for Approaching a Known Dog? You may assume that it is safe in certain contexts to approach a dog that you know. However, you still need to exercise caution and respect the dog’s space. 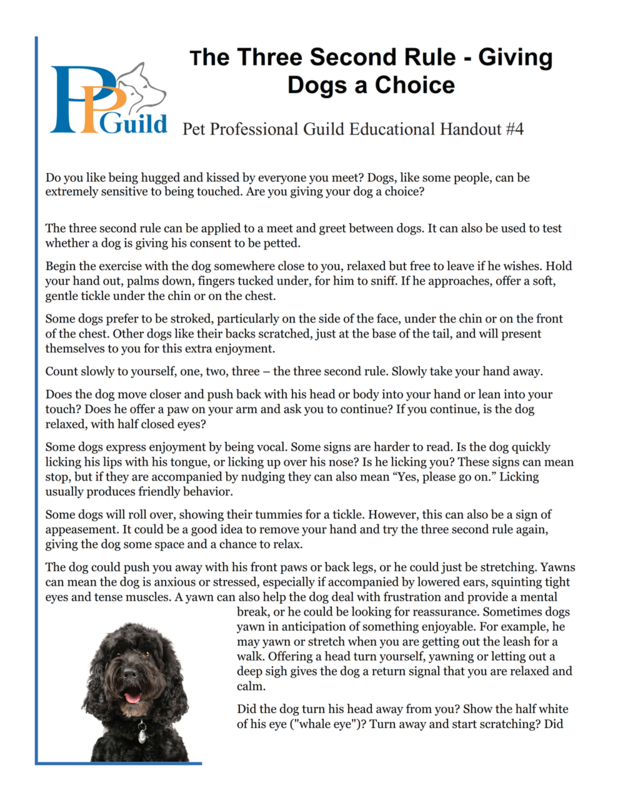 Every child – and adult for that matter – should be taught a few basic rules about how and when to approach a dog. The majority of dog bites occur in the home with a known dog. This might be the family’s own dog or the dog of a friend, relative or neighbour. The majority of dog bite victims are children but, with greater awareness and careful management, many of these bites could be prevented. Do you like being hugged and kissed by everyone you meet? Dogs, like some people, can be extremely sensitive to being touched. Are you giving your dog a choice? The three second rule can be applied to a meet and greet between dogs. It can also be used to test whether a dog is giving his consent to be petted. Begin the exercise with the dog somewhere close to you, relaxed but free to leave if he wishes. Hold your hand out, palms down, fingers tucked under, for him to sniff. If he approaches, offer a soft, gentle tickle under the chin or on the chest. Some dogs prefer to be stroked, particularly on the side of the face, under the chin or on the front of the chest. Other dogs like their backs scratched, just at the base of the tail, and will present themselves to you for this extra enjoyment. 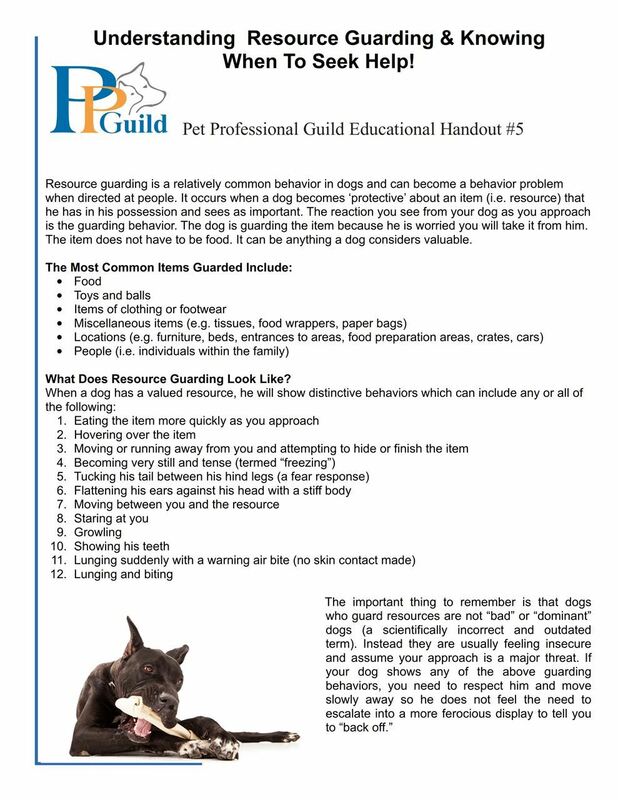 Resource guarding is a relatively common behavior in dogs and can become a behavior problem when directed at people. It occurs when a dog becomes ‘protective’ about an item (i.e. resource) that he has in his possession and sees as important. 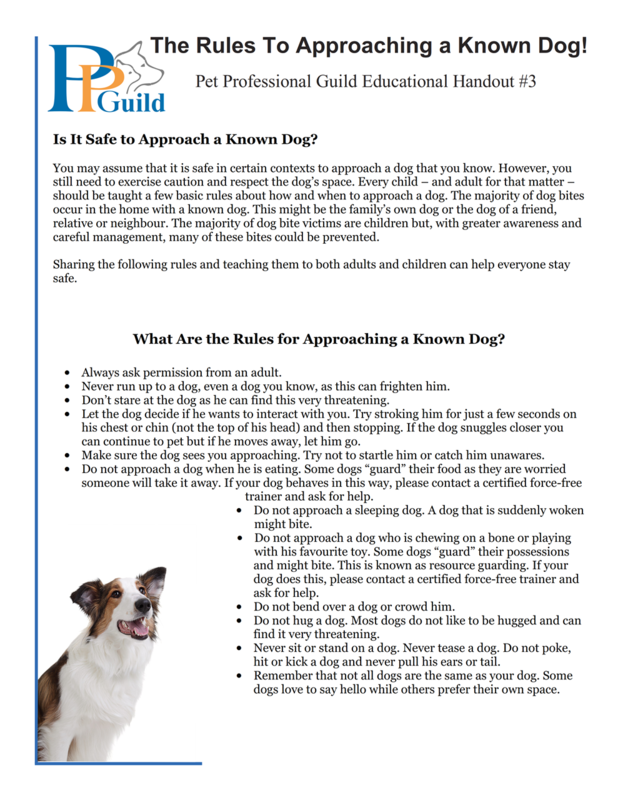 The reaction you see from your dog as you approach is the guarding behavior. The dog is guarding the item because he is worried you will take it from him. The item does not have to be food. It can be anything a dog considers valuable. Do you have a new dog/pup in the family? If you are reading this before you even get your new best friend, then you are on the right track. If you already have your dog start looking for a class now. School or Independent Trainer? Decide if you want to work within the confines of a school or with an independent trainer. Neither is wrong – it depends on what suits you. Insurance: Make sure the school or trainer has at least third party insurance coverage. Group or Private Training? Try a couple of private lessons then join a group to see which suits you and your dog better. Nervous or reactive dogs may be better off starting out with a private trainer. Unlike some professions, there is currently no single ethical standard and no centralized or government licensing board for dog trainers and behavior consultants. As a result, consumers face a confusing landscape of philosophies and marketing language. 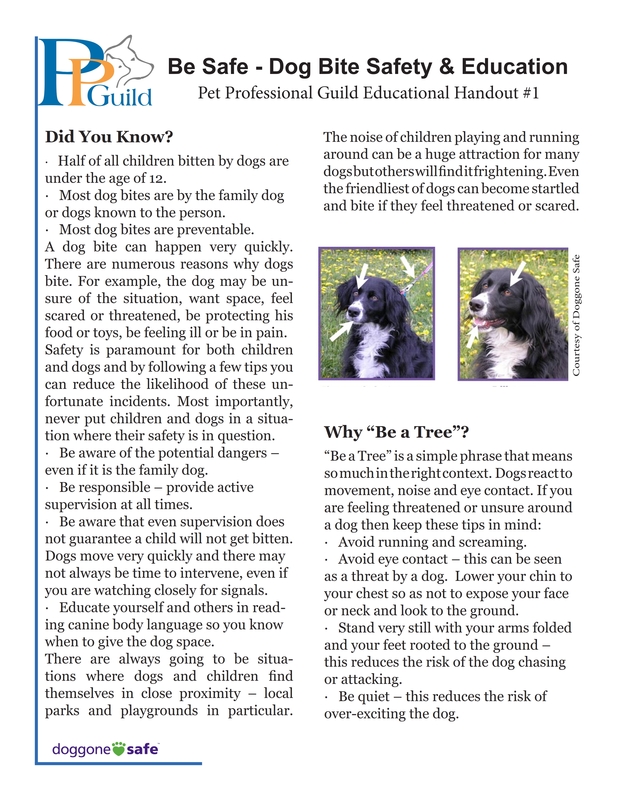 The following suggestions will help dog owners find a competent, ethical trainer and keep their pet(s) safe. 1. 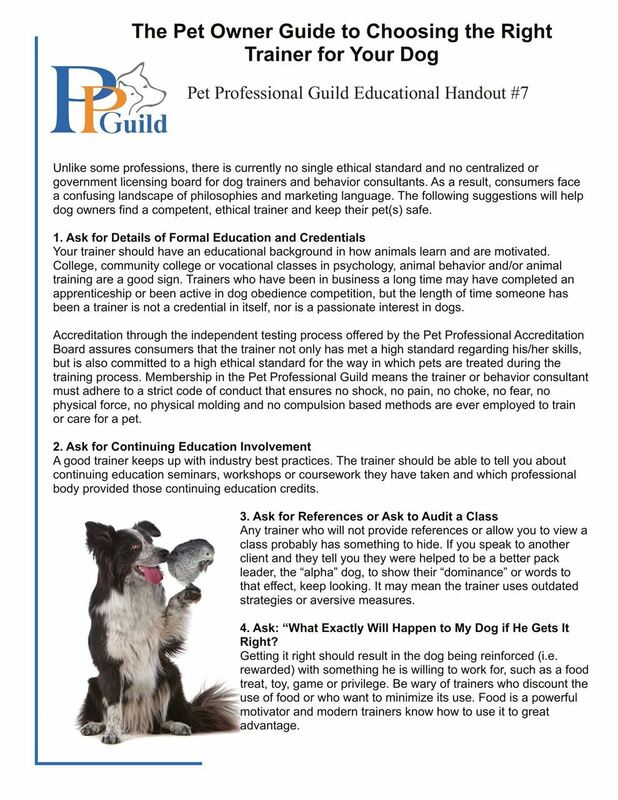 Ask for Details of Formal Education and Credentials Your trainer should have an educational background in how animals learn and are motivated. College, community college or vocational classes in psychology, animal behavior and/or animal training are a good sign. Trainers who have been in business a long time may have completed an apprenticeship or been active in dog obedience competition, but the length of time someone has been a trainer is not a credential in itself, nor is a passionate interest in dogs. Puppies have needle-sharp teeth that really hurt so it is important to train them to control their biting and mouthing behavior from an early age. If we do not, rough play or other interactions could cause people to get hurt. Also, biting and mouthing can negatively impact people’s ability to bond with their pup. 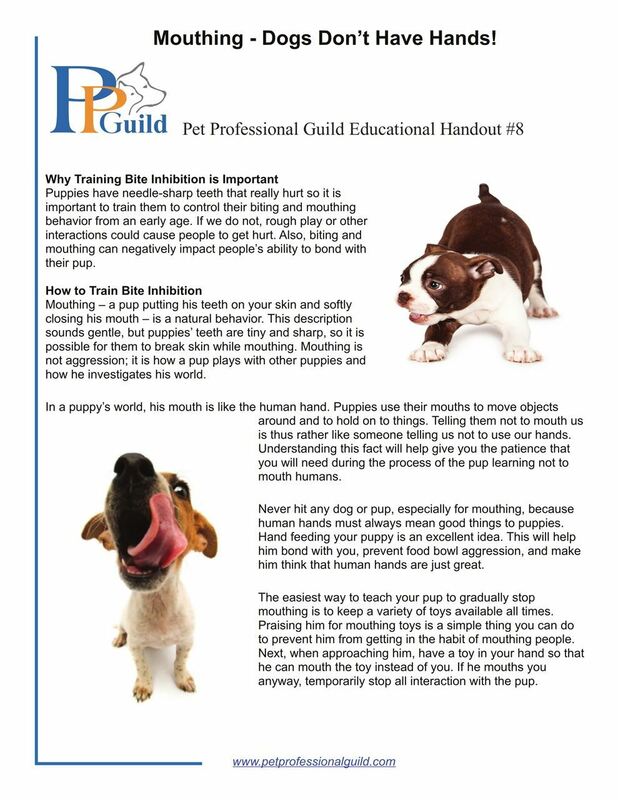 Mouthing – a pup putting his teeth on your skin and softly closing his mouth – is a natural behavior. This description sounds gentle, but puppies’ teeth are tiny and sharp, so it is possible for them to break skin while mouthing. Mouthing is not aggression; it is how a pup plays with other puppies and how he investigates his world.